As Wet Paint enters its 41st year on Grand Avenue in Saint Paul owner Beth Bergman is excited to announce her retirement at the end of 2016. Long-time employees Darin Rinne and Scott Fares will become the new proprietors. After 33 years provisioning artists in the Twin Cities and across the country Beth intends to move to the other side of the counter and focus on making art herself. Wet Paint is renowned for its excellent selection of over 35,000 high quality art supplies and papers and the knowledgeable staff that supports artists of all levels of intention. Located at the corner of Grand and Cambridge, Wet Paint has grown from a small storefront serving local students into a nationally and internationally recognized center for quality and expertise. 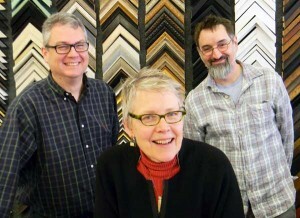 In 2015 the store expanded to increase the framing department and add space dedicated to classes for kids and adults on everything from origami and printmaking to watercolor techniques and mat cutting. Bergman and Wet Paint are both well known for their support of the arts, artists, and independent business, a distinction that will continue under Darin and Scott’s direction. For questions please contact Scott Fares or Darin Rinne at 651 698 6431. Email: darin@wetpaintart.com, scott@wetpaintart.com.